Wood captain’s clock with a circular glass in the top. 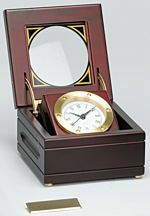 The 6” x 6” x 3.75” case has a hinged top that allows the clock to rise out of the box for easy viewing. The optional engraving can be attached to the front of the case.